For other people named James Ingram, see James Ingram (disambiguation). James Edward Ingram (February 16, 1952 – January 29, 2019) was an American singer, songwriter, record producer, and instrumentalist. He was a two-time Grammy Award-winner and a two-time Academy Award nominee for Best Original Song. Since beginning his career in 1973, Ingram had charted eight Top 40 hits on the U.S. Billboard Hot 100 chart from the early 1980s until the early 1990s, as well as thirteen top 40 hits on the Hot R&B/Hip-Hop Songs chart. In addition, he charted 20 hits on the Adult Contemporary chart (including two number-ones). He had two number-one singles on the Hot 100: the first, a duet with fellow R&B artist Patti Austin, 1982's "Baby, Come to Me" topped the U.S. pop chart in 1983; "I Don't Have the Heart", which became his second number-one in 1990 was his only number-one as a solo artist. In between these hits, he also recorded the song "Somewhere Out There" with fellow recording artist Linda Ronstadt for the animated film An American Tail. The song and the music video both became gigantic hits. Ingram co-wrote "The Day I Fall in Love", from the motion picture Beethoven's 2nd (1993), and singer Patty Smyth's "Look What Love Has Done", from the motion picture Junior (1994), which earned him nominations for Best Original Song from the Oscars, Golden Globes, and Grammy Awards in 1994 and 1995. Ingram was born in Akron, Ohio, where he attended Akron's East High School and received a track scholarship to the University of Akron. Subsequently he moved to Los Angeles and played with the band Revelation Funk, which made an appearance in the Rudy Ray Moore film Dolemite. He also later played keyboards for Ray Charles before becoming famous. James Ingram received his first publishing deal with 20th Century Fox publishing company, which is where he sang the $50 demo for "Just Once". Ingram provided the vocals to "Just Once" and "One Hundred Ways" on Quincy Jones's 1981 album The Dude, which earned Ingram triple Grammy nominations, including Best New Artist. "One Hundred Ways" won him the Grammy Award for Best Male R&B Vocal Performance for his work. On December 11, 1981, Ingram appeared as a guest on the Canadian comedy series SCTV (which aired on NBC), singing "Just Once". Ingram's debut album, It's Your Night, was released in 1983 and included the ballad "There's No Easy Way". He worked with other notable artists such as Donna Summer, Ray Charles, Anita Baker, Viktor Lazlo, Nancy Wilson, Natalie Cole, and Kenny Rogers. In October 1990, he scored a No. 1 hit on the Billboard Hot 100 with the love ballad "I Don't Have the Heart", from his It's Real album. In 1984, Ingram received three additional Grammy nominations: "How Do You Keep the Music Playing?" (his second duet with recording artist Patti Austin), for Best Pop Performance by a Duo or Group with Vocals; the US Top 10 single, "P.Y.T. (Pretty Young Thing)" for Michael Jackson, which Ingram and Quincy Jones co-wrote, for Best R&B Song; and the track "Party Animal" for Best Male R&B Vocal Performance. In early 1985, he was nominated for his debut album (It's Your Night) for Best Male R&B Vocal Performance, and for its single, "Yah Mo B There" (a duet with fellow R&B musician Michael McDonald), for Best R&B Song and Best R&B Performance by a Duo or Group, and won the latter. Ingram is perhaps best known for his hit collaborations with other vocalists. He scored a No. 1 hit on the Hot 100 chart in February 1983 with Patti Austin on the duet "Baby, Come to Me", a song made popular on TV's General Hospital. A second Austin–Ingram duet, "How Do You Keep the Music Playing? ", was featured in the movie Best Friends (1982) and earned an Oscar nomination. In 1984, he teamed up with Kenny Rogers and Kim Carnes for the Top 40 ballad "What About Me?" In 1985, Ingram won a Grammy Award for "Yah Mo B There", a duet with Michael McDonald, and participated in the charity single "We Are the World". Ingram teamed with American vocalist Linda Ronstadt and had a top ten hit in the U.S. and the U.K. in 1987 with "Somewhere Out There", the theme from the animated feature film An American Tail. The song was awarded the 1987 Grammy Award for Song of the Year. It also received Academy Award and Golden Globe nominations. It was one of the last million-selling Gold-certified 45 RPM singles to be issued by the RIAA. In the 1990s, Ingram's highest-profile team-up came again with Quincy Jones, on the song "The Secret Garden". This song also featured vocals by Barry White, El DeBarge, and Al B. Sure!. Soundtrack songs were popular for Ingram in the 1990s. From the movie Sarafina! came "One More Time", and from City Slickers came "Where Did My Heart Go?" In 1991, he and Melissa Manchester performed the song "The Brightest Star" in the animated Christmas film Precious Moments Timmy's Gift. In 1993, they performed the song again in the film's sequel Precious Moments Timmy's Special Delivery. Ingram's 1994 composition "The Day I Fall in Love", a duet with Dolly Parton, was the theme song for the movie Beethoven's 2nd and was nominated for an Academy Award for Best Original Song. Ingram and Parton performed the song live on the Oscar broadcast. In 1997, he and Carnie Wilson co-wrote the song "Our Time Has Come" and lent it to the animated film Cats Don't Dance. During the summer of 2004, Ingram participated in the U.S. television reality show Celebrity Duets as a duet partner. The show combined professional vocalists, of various musical genres, with entertainers of different backgrounds in a weekly elimination competition. In 2006, Ingram and neo-soul singer Angie Stone teamed up on "My People". In 2011, Ingram joined Cliff Richard's list of special guest performers on his Soulicious Tour performing at various UK venues during November. He sang two songs from the album with Richard, as well a solo of "Just Once". In 2012, Ingram appeared as himself in the ABC television show Suburgatory, in the episode "The Motherload". Also in 2012, he was a guest vocalist at Debbie Allen's October 13 live show at the corner of Crenshaw Blvd. and Martin Luther King Blvd. celebrating the arrival of the Space Shuttle Endeavour, singing R. Kelly's "I Believe I Can Fly". James Ingram died on January 29, 2019, after a long battle with brain cancer. He was 66. Ingram has won two Grammy Awards out of fourteen nominations. ^ "Music Makers James Ingram". The HistoryMakers. Retrieved January 4, 2013. ^ "James Ingram, Grammy-Winning R&B Singer, Dies at 66". The Hollywood Reporter. Retrieved January 29, 2019. ^ Abram, Malcolm (January 29, 2019). "Akron-born singer James Ingram dies at 66". Akron Beacon Journal. Retrieved January 30, 2019. ^ a b c d e f g h Sweeting, Adam. "James Ingram obituary". The Guardian. Retrieved February 2, 2019. ^ "Just Once". Music VF. Retrieved February 2, 2019. ^ Joel Whitburn's Top Pop Singles 1955-1990. ISBN 0-89820-089-X. ^ "The 24th Annual Grammy Awards". IMDB. Retrieved February 2, 2019. ^ "Series 4 Cycle 2". SCTV Guide. Retrieved December 5, 2014. ^ "The Hot 100 : Oct 20, 1990 | Billboard Chart Archive". Billboard. Retrieved April 30, 2014. ^ a b Snapes, Laura. "James Ingram, R&B star and Michael Jackson collaborator, dies aged 66". The Guardian. Retrieved February 2, 2019. 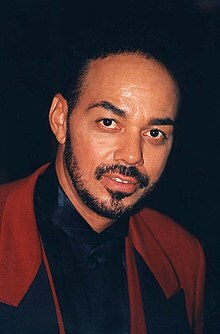 ^ a b "US R&B singer-songwriter James Ingram dies aged 66". BBC News. Retrieved February 2, 2019. ^ "The Hot 100 : Feb 19, 1983 | Billboard Chart Archive". Billboa. Retrieved April 30, 2014. ^ "The 55th Academy Awards (1983) Nominees and Winners". AMPAS. Retrieved February 2, 2019. ^ "The Hot 100 : Mar 14, 1987 | Billboard Chart Archive". Billboard. March 14, 1987. Retrieved April 30, 2014. ^ "Linda Ronstadt – Chart History". Billboard.com. Retrieved February 2, 2019. ^ "The 59th Academy Awards – 1987". Oscars.org. Retrieved February 2, 2019. ^ "James Ingram". Grammy.com. Retrieved February 2, 2019. ^ White, Adam; Bronson, Fred (1993). The Billboard Book of Number One Rhythm & Blues Hits. New York: Billboard Books:Watson-Guptill Publications. p. 469. ISBN 9780823082858. ^ Whitburn, Joel (2004). Top R&B/Hip-Hop Singles: 1942-2004. Record Search. ISBN 978-0898201604. ^ a b "1993 Academy Awards® Winners and History". Film Site. Retrieved February 2, 2019. ^ "Beethoven's 2nd (1993)". AFI. Retrieved February 2, 2019. ^ "The Celebrity Duets premiere: Hits and misses". Entertainment Weekly. Retrieved February 2, 2019. ^ "My People by Angie Stone". Song Facts. Retrieved February 2, 2019. ^ Michael, Hann. "Cliff Richard – review". The Guardian. Retrieved February 2, 2019. ^ "Cliff Richard – The Soulicious Tour". Cliff Richard Organisation. Archived from the original on June 16, 2012. Retrieved June 5, 2012. ^ a b "The Motherload". IMDB. Retrieved February 2, 2019. ^ Battle, Chelsea. "Space Shuttle Endeavour Exhibit Opens to the Public at the California Science Center". Los Angeles Sentinel. Retrieved February 2, 2019. ^ "James Ingram, R&B Singing Star, Dead At 66". Top-40 Charts. Retrieved February 2, 2019. ^ Rod, Pyle. "Newly Opened Space Shuttle Endeavour Exhibit Thrills California Crowds". Space.com. Retrieved February 2, 2019. ^ "Award-Winning R&B Singer James Ingram Dies At 66". National Public Radio. January 30, 2019. Retrieved February 25, 2019. ^ a b "James Ingram US certifications". riaa.com. Archived from the original on June 26, 2007. ^ a b "James Ingram: Billboard 200". billboard.com. ^ a b "James Ingram: Top R&B/Hip-Hop Albums". billboard.com. ^ "James Ingram: Top Gospel Albums". billboard.com. ^ a b "James Ingram". officialcharts.com. ^ "James Ingram: Hot 100". billboard.com. ^ "James Ingram: Hot R&B/Hip-Hop Songs". billboard.com. ^ "James Ingram: Adult Contemporary Songs". billboard.com. ^ "James Ingram / Donna Summer – Mystery of Love". All Music. Retrieved February 2, 2019. ^ ""One More Time"". ReverbNation. Retrieved February 2, 2019. ^ "Grammy's Greatest Moments, Volume III: Various Artists". Amazon.com. Retrieved November 23, 2011. ^ "James Ingram – Wish You Were Here". All Music. Retrieved February 2, 2019. ^ "Original Soundtrack Cats Don't Dance". All Music. Retrieved February 2, 2019. ^ "Scorpions – Eye II Eye". All Music. Retrieved February 2, 2019. ^ "Michael McDonald – One Gift". All Music. Retrieved February 2, 2019. ^ Ruhlmann, William. "Patti Austin – On the Way to Love". All Music. Retrieved February 2, 2019. ^ "Fearless Four, The(1997)". Turner Classic Movies. Retrieved February 2, 2019. ^ "1994 Academy Awards® Winners and History". Film Site. Retrieved February 2, 2019. ^ "Golden Globe nominations". Variety. Retrieved February 2, 2019. ^ "Film, TV Nominees for the Golden Globes". Los Angeles Times. Retrieved February 2, 2019. Wikimedia Commons has media related to James Ingram.